View birds feeding closer than ever before with the Coveside Panoramic In-House Bird Feeder with Mirrored Back. This classic feeder rests in your window, allowing birds to feed inside your home. The back of the item has a one-way mirrored plastic panel, so you may observe the birds without them seeing you. The mahogany feeding platform can accommodate up to one full quart of mixed seed, or fruit and mealworms for more specific feeding. The wide opening allows several birds to feed at once, while a circular cut out at the top of the item enables quick refilling. 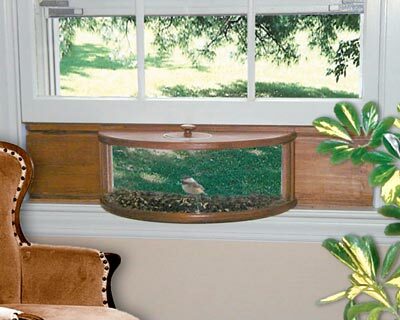 This dramatic feeder is designed to be mounted in most double hung windows 24" to 36" wide, and can be placed completely inside the window or within it for versatility. Use the included wooden side panels, insulation, and Velcro strips for proper installation and to keep the window properly insulated. This sturdy feeder is constructed of mahogany for several seasons of use, and the darker brown color of the wood adds an elegant feel. Delight in the antics of birds right in your home with this Panoramic In-House Bird Feeder with Mirrored Back. Made in the USA.